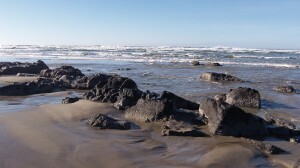 » Coast update: Sea level? 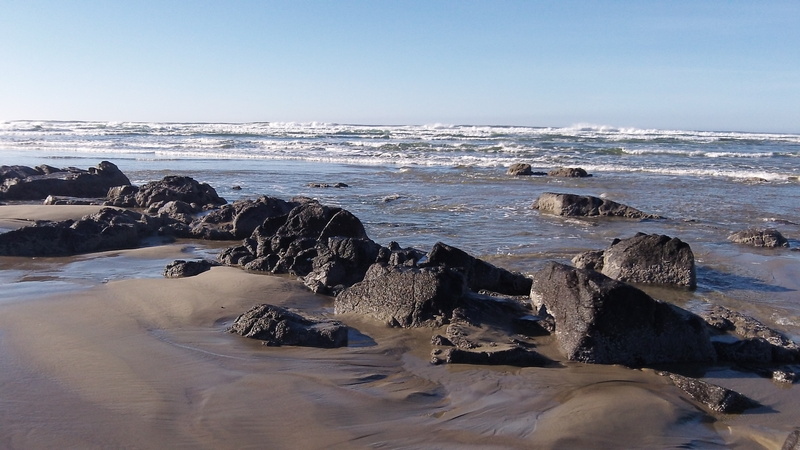 As long as these rocks remain visible in the Yachats River estuary, sea level rise is under control. Just in case you were wondering what was happening at the central Oregon coast, here’s a video update, shaky and wind-noisy it may be. The short answer is that nothing has changed since the last update a month or so ago. Except that on Dec. 16 the weather was sunny and mild, very nice. The main thing: No rise in the sea level is evident, global climate change and all kinds of hysterical warnings to the contrary notwithstanding. OK, OK, I know it’s not supposed to be visible or noticeable until maybe 30 or 40 years from now. What with a lively surf and the ever-changing tides, I’m not sure if we’ll ever actually notice a change. But as long as we don’t, it can’t be all that significant. No? OK, we all know that the sea isn’t rising – the polar bears are safe, warm, and fuzzy – that the ice capes are actually growing – and that, for the last 17 years, the planet has actually been cooling. Yet people on the left still insist that global warming is a major hazard. We’ve seen you report on these things many times. What we haven’t seen is an indepth account of just why the left persues this train of thought. Why do they do that? What’s their motivation? What’s in it for them to continue the charade of AGW? Do you know Hasso? Care to enlighten us? Ray’s right: Just because it’s not evident in a locality does not mean its not happening elsewhere. But the global warmers often cite local phenomena — flowers blooming earlier, migratory birds hanging around longer in the fall, that kind of stuff — as yet another indication of warming or change. Multnomah County recently issued a report on what should be done to prepare for the effects of warming. To warrant action, those effects have to be local and noticeable. If they’re not, then it makes no sense to react to them or prepare for them. So what is noticeable locally does become important to the issue.